Five years ago Kia Motors America (KMA) debuted the re-designed Optima at the New York International Auto Show and introduced a game-changing midsize sedan that catalyzed the brand's design-led transformation. History was repeated when the all-new 2016 Optima, a symbol of the Kia brand's maturation through continuous refinement and obsessive attention to detail, made its debut here today. 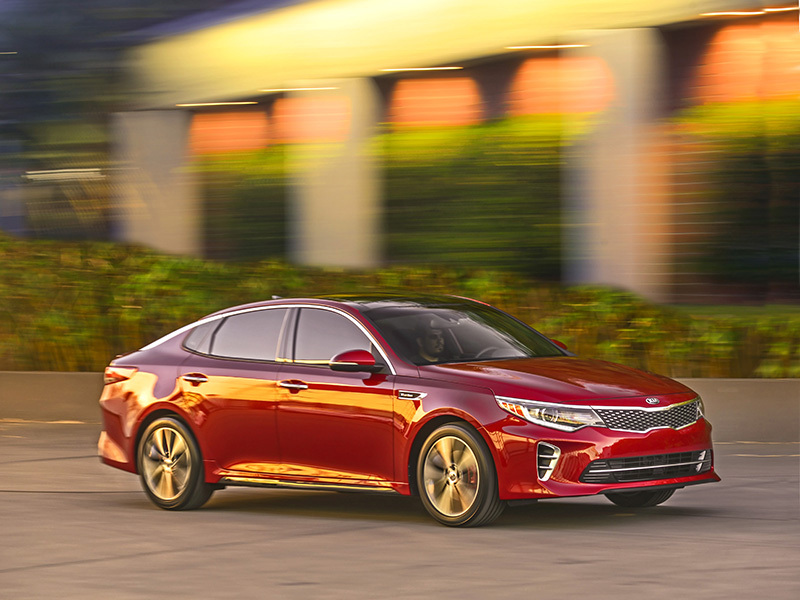 An instant hit with consumers looking for a fresh alternative to an otherwise staid segment, the Optima has been KMA's top-selling vehicle for three consecutive years, and the all-new model is poised to continue that success. Conceived under the watchful eye of Kia's president and chief design officer, Peter Schreyer, with modern and instantly recognizable design cues, the Optima maintains its athletic identity but rides on a chassis that is longer, wider and stiffer for improved ride and handling and a more spacious cabin. Available with three engine choices, including a new 1.6-liter turbocharged four-cylinder that's mated to a seven-speed Dual Clutch Transmission (DCT), the Optima is more confident than ever on the road. The all-new Optima's roomier, more luxurious cabin features an impressive level of craftsmanship that will come standard across five trim levels – LX, LX Turbo, EX, SX Turbo and SXL – when sales begin in the fourth quarter of 2015. As with its predecessor, the all-new Optima will be built at Kia's plant* in West Point, Georgia. Pricing will be announced closer to the vehicle's launch date. "The Optima changed the way people felt about the Kia brand, and KMA owes much of its growth and success to its head-turning design and sporty performance. It was – and still is to this day – a fresh alternative in the midsize sedan segment, and it amplified a five-year design-led transformation that propelled Kia to record-setting sales year-on-year," said Michael Sprague, executive vice president, sales and marketing, KMA. "The all-new Optima retains the signature personality of its predecessor, but we've literally improved everything, providing more space, better ride and handling, more technology and greater refinement." Because the previous generation Optima was such a success story for the brand, Kia's designers had to strike a delicate balance, retaining the identity of the vehicle while, at the same time, making a confident move forward to keep the car modern and fresh. Sweeping contemporary surfaces and modern architecture inspired the design of the all-new Optima, revealing a sophisticated and dynamic sedan that is instantly recognizable yet has more road presence than ever. The aggressive front clip pulls the sheet metal taut over the wheel arches, and the swept-back headlights reach deeply into the fenders. On the SX and SXL trims, Kia's signature tiger-nose grille is hot stamped and composed into a sophisticated pinpoint design that bears a strong resemblance to Kia's luxury sedan, the K900 . The all-new Optima introduces Kia's first application of bi-functional HID headlights – with available Dynamic Bending Lamps and High Beam Assist – that illuminate the tarmac around corners. The 2016 Optima rides on alloy wheels ranging from 16 to 18 inches, with three new unique 18-inch wheel designs, depending on trim level. Three new exteriors colors compliment the latest Optima's sophisticated styling: a vibrant blue inspired by a sparkling ocean underneath a sunny sky; a dynamic grey with olive undertones, and a deep red that gains depth from the use of aluminum pigments. Optima's interior is larger and more comfortable with an innovative and functional cabin that is well-appointed with class-up touches. Drawing inspiration from Kia's premium and luxury sedans, the Optima utilizes more soft-touch materials throughout the passenger compartment. Optima's luxurious interior is obsessively crafted with an impressive attention to detail and features real stitching along the dash and doors, complimented by tasteful metallic accents, varying by trim level. The driver-oriented cabin has been simplified with a cleaner, more unified design than the previous generation, with a stronger horizontal plane and a wider center console that help create a greater sense of space. By grouping and reducing the number of functional keys and buttons, Kia's already-superior ergonomics are markedly improved. Kia's cutting-edge connectivity system, UVO , comes standard with four additional eServices not previously available on Optima: Geo-fencing, Speed Alert, Curfew Alert and Driving Score . Additionally, Optima is Kia's pilot vehicle for the introduction of AndroidTM Auto and Apple® CarPlay (late availability), which allow drivers to access a suite of core functions from their smartphones. After connecting their smartphone to the head unit via the vehicle's front fast-charge USB port (another fast-charge USB port is located in the rear seat), the 8-inch touchscreen screen displays the smartphone's most important features. Core functions including music, messaging, navigation and voice calls are available via the screen, the steering wheel or via voice command2. Kia is one of the first to deliver this technology, which is available for select Android phones operating with Lollipop or Apple phones operating with iOS8.X or higher. Any future third-party apps that are added by either Android or Apple will be available for customers to enjoy from their respective app store. While the standard six-speaker audio system will satisfy all but the most demanding enthusiasts, true audiophiles will gravitate to the available Infinity® Premium Audio System , which includes 14 speakers, Clari-Fi™ technology and an upgraded 630-watt digital amplifier. Clari-Fi is a patented music restoration technology that rebuilds audio signals that are lost in the digital compression process. This technology breathes new life into your favorite music, restoring a high-fidelity listening experience to any compressed digital source. Optima's premium Infinity audio system also comes equipped with next-generation QuantumLogic™7 Surround technology, which extracts signals from the original recording and redistributes them into an authentic, multidimensional soundstage for playback that is clear, refined and detailed. Kia was one of the first automakers to incorporate Clari-Fi technology into their audio systems with the debut of the 2016 Sorento, and Optima is the first-ever Kia sedan to feature QuantumLogic Surround technology. Smart Performance and SafetyThe 2016 Optima features a uniquely engineered body that combines various high-tensile strength steel alloys and sits on a chassis that is stiffer and more durable thanks to the increased use of Advanced High Strength Steel (AHSS). With more than 50 percent of the body constructed from AHSS, the all-new Optima represents a 150-percent increase over the previous car. The greater use of structural adhesive by more than 450 percent over the previous generation improves NVH and contributes to structural rigidity. Engineers also added more hot stamped components to the all-new Optima, a 350-percent increase over the 2015 model. This body structure helps provide crash protection, better driving dynamics, and is the foundation for a quieter ride. Additional innovations were implemented to reduce NVH, lighten the vehicle and enhance aerodynamics. The 2016 Optima is the first Kia to feature a panoramic sunroof support structure made with carbon-fiber-reinforced plastic, which helps reduce weight and lower the vehicle's center of gravity. A larger full floor under cover helps reduce wind noise and aid fuel efficiency. Increased dash insulation, added windshield side molding and the increased use of structural adhesive ensure a quiet ride with reduced road and wind noise. Engine mounts, body panels and wheels all are stiffer on the all-new Optima, reducing vibrations, engine noise and road noise. Larger cross-member bushings are utilized to help isolate road and engine noise, as well as reducing engine vibration through the floor and steering wheel. All new for the 2016 model is a 1.6-liter four-cylinder turbo engine. The 1.6-liter will be offered on the LX trim. Pushing out an estimated 178 horsepower at 5,500 rpm and a stout 195 lb.-ft. of torque at just 1,500 rpm, the new engine mates to a seven-speed DCT, a first for the Kia brand. The transmission optimizes the engine's responsiveness for a sporty feel that doesn't sacrifice fuel economy. Also new for the Optima, Michelin® tires are available on all trims. All three engines channel energy through the front wheels.